Farmers’ organization Krishak Mukti Sangram Samiti (KMSS) in support with other organisations on Monday took out a mass protest rally against the Citizenship (Amendment) Bill, 2016 at Dibrugarh. The rally which started from the Old Government Boys’ High School field passed through the main streets of Dibrugarh. The protestors shouted slogans holding placards and banners demanding scrapping of the Citizenship (Amendment) Bill, 2016. The agitators shouted slogans refusing to take the ‘burden of foreigners’ and criticised the BJP- led Government in the State for supporting the Centre’s attempt to amend the controversial Bill. He also asserted, “The Citizenship (Amendment) Bill, 2016 should be scrapped as it is a threat to the culture, language and identity of the Assamese people.” Gogoi said the Narendra Modi-led BJP Government at the Centre is trying everything possible to pass the Bill. The Citizenship (Amendment) Bill, which was tabled in the Parliament in August, 2016, seeks to amend the Citizenship Act, 1955. The Bill seeks to provide citizenship to religious minorities other than Muslims, from Bangladesh, Pakistan and Afghanistan in India, who have come here till December 31 of 2014. On the other hand, according to the Assam Accord, those people who came after March 24, 1971 should be treated as illegal migrants but if the Bill is passed, the religious minorities including Hindu Bangladeshis from Bangladesh would get Indian citizenship. “The Bill is a ploy of the BJP and the RSS to break the secular Assamese community into a linguistic minority and make us politically weaker. 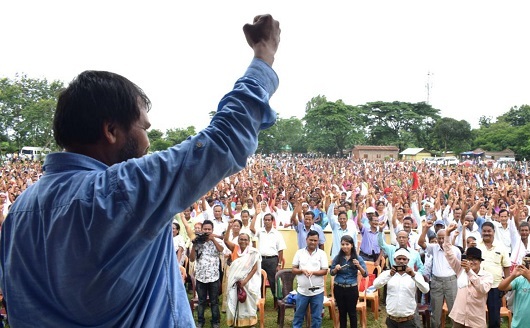 We cannot allow Assam to be a dumping ground of 1.5 crore Hindu-Bangladeshis and so, we will fight against it till the Bill is withdrawn,” peasants’ leader Akhil Gogoi said.